L.E.O. (Low Earth Orbit) is a game about putting as many satellites in orbit as you can without causing a collision. You have 100 years on this planet to make as much money as you can with your fleet of satellites. Click and drag to launch a satellite. Right click to rotate your view. Super dope guys. I really liked the debris as a method of persistence for my mess up and how it drifts into other satellite paths, but at the same time the persistence of satellites destruction feels punishing and i found myself just restarting the game. Otherwise i think the musical notes is a fine touch. What could also be cool is having the satellites that have been around for longer develop their small musical motifs or patterns. As i said earlier Super Dope peeps! Well Done. Thanks for playing dude. Great feedback as well. 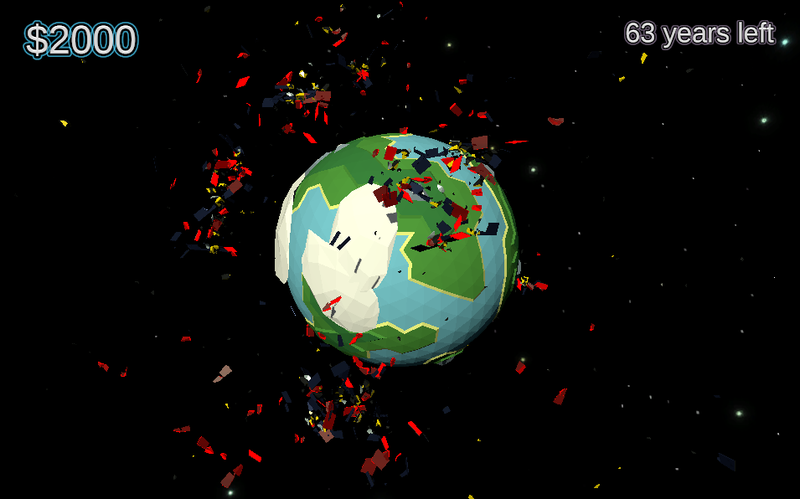 Seems there is a communication gap; you can click (red) debris to destroy it, so that your orbit space is cleared up. I'll update the description to explain that. Thanks for pointing it out though. And the musical idea is great! Trust you to come up with genius like that. He's talking about the debris that aren't red, Bracken.